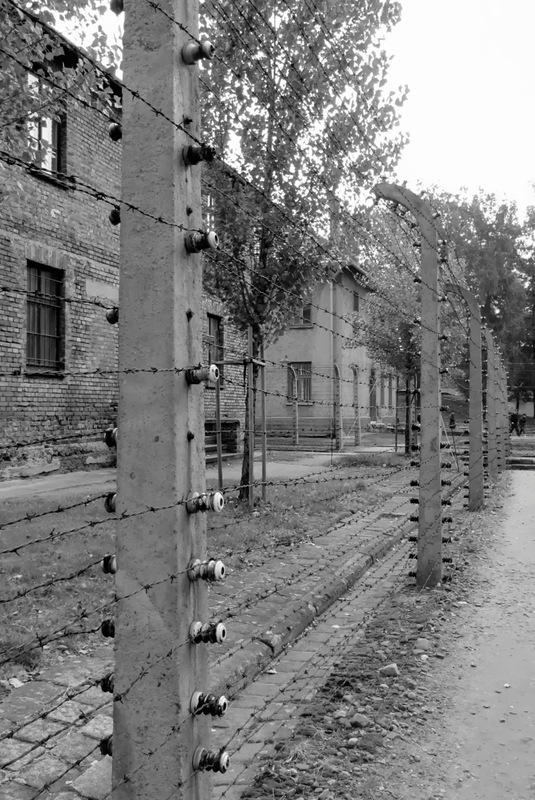 It is difficult to describe the profoundly humbling experience of a visit to Auschwitz. The bus stops right at the entrance to the Auschwitz Museum, where we joined the crowds of visitors in line for tickets, then again lining up for our headsets. There are tours offered in several languages, and we had only a short 20 minute wait for an English tour. Our guide was a young man who spoke excellent English. We were very pleased with our tour, as our guide was sensitive and respectful while presenting facts and statistics in a very calm and non-sensational manner. We walked the short distance to the entrance gates to Auschwitz, the same gates over a million prisoners walked through upon their arrival. Only a tiny fraction survived. English translation from German: Work makes you free. 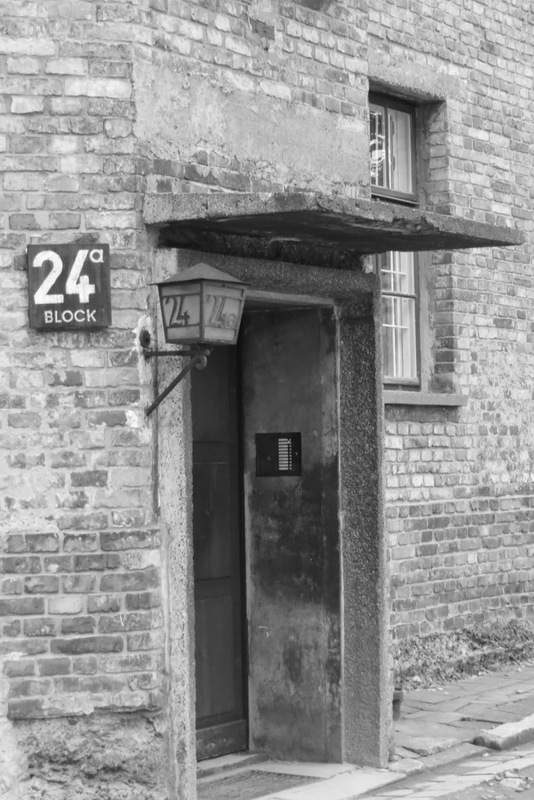 This sign was made and erected by some of the first prisoners in Auschwitz. Of course, work did not free the hundreds of thousands of prisoners, but instead resulted in their death. There were about 20 visitors in our group, and our guide led us through several buildings. At the first cell block he paused in front of a large map of Europe, giving us an idea of how far away some of the prisoners came. A gentleman in our group made his own quiet statement by wearing an Israeli flag throughout the tour. Although photos were allowed in most of the buildings, I only took a few inside. This is a picture of the sleeping areas, and our guide told us that 2 or more prisoners were often assigned to each bunk. This is a long hallway in one of the cell blocks, lined with identification photos taken of each prisoner upon arrival. These photos were taken after the Nazis had taken their clothes, de-loused them, tattooed with identification numbers and symbols, shaved their heads, and given them stripped prison clothes. The Nazis kept meticulous records, and each photo gave the name, date of birth, date of arrival at Auschwitz, and date of death. The average was 2-3 months, some longer, many much shorter. The sad fact: these photos were only a very tiny percentage of the people transported to Auschwitz. 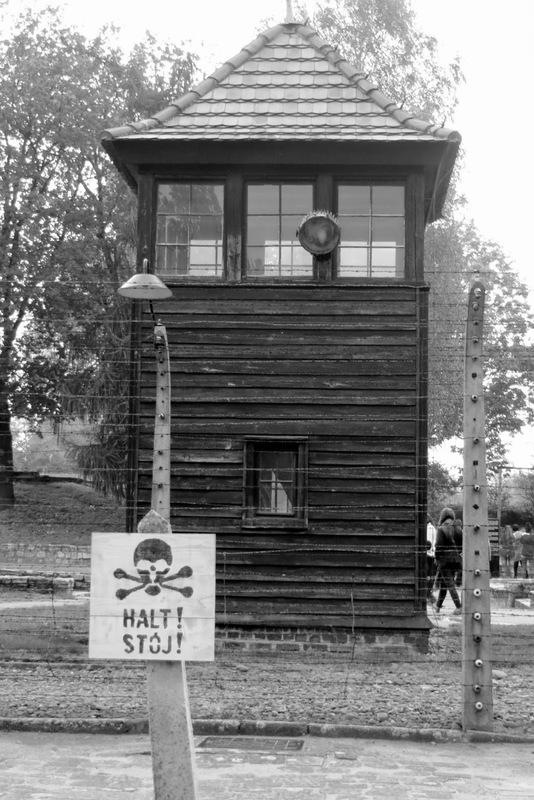 Those deemed unfit to work--the elderly, the handicapped, and almost all children under 14 and their mothers were sent straight to the gas chambers. It was a long, sobering walk down this hall. It was silent.......no one spoke. We were taken to a cell block containing exhibits of prisoner's personal effects. There is one room, about the size of a walk in closet, filled with human hair. This is only a very small fraction of the several tons of hair taken from the prisoners and those who were gassed immediately upon arrival. Incredibly, the Nazis saved the hair, packing it in large bags and then sold it to German businesses for use in making mattresses, weaving fabric, etc. Chilling. There were also exhibits of childrens' toys, suitcases with names and addresses carefully written on the front, a small room filled with prosthesis--leg and back braces, prosthetic arms and legs, etc. Truly heartbreaking. So many hopes and dreams. The last area we visited was the gas chambers and crematorium. It was somber, dark, horrific; we did not linger. Next to the gas chambers there is a small area with a gallows. On April 16, 1947, after being tried and found guilty by The International Military Tribunal, Rudolf Hoess, Auschwitz camp commandant, was hanged. In sight of the very place thousands of innocent people were murdered under his command and direction. The ultimate justice? I don't have the answer. An eye for an eye? I do not know. Ghandi: An eye for an eye, and the whole world is blind. The most currently accepted estimate is that over 1.1 million fellow humans, people just like you and I, were killed at Auschwitz. 960,000 of these were Jews.